Told in the fun and colourful style that makes the Lost Sheep series a hit with 4-7s, this Nativity story is full of life and character. 'Bless my socks! Dance and sing! This little bub is God's high king!, Join Brown Cow, the shepherds and the wonderful welcoming people of Bethlehem town in this Christmas celebration. Based on the Luke 2:1-20 NIVUK translation, this biblical story is set in your traditional middle eastern home. When Jesus wanted to change lives he told stories. That's what we do at Lost Sheep - and at the centre of our stories is Jesus. Some stories are about him, some are by him, but all of them point to him. We take the spirituality of children seriously but also believe the gospel is fun. 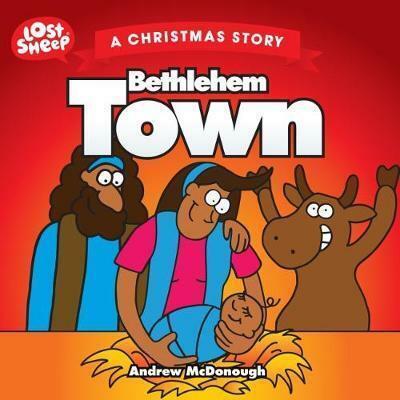 Bethlehem Town by Andrew McDonough was published by Sarah Grace Publishing in September 2018 and is our 10888th best seller. The ISBN for Bethlehem Town is 9781910786994. Be the first to review Bethlehem Town! Got a question? No problem! Just click here to ask us about Bethlehem Town.